U.S. equity index futures were lower this morning. S&P 500 futures were down 8 points in pre-opening trade. Index futures drifted lower following release of the U.S. December Consumer Price Index at 8:30 AM EST. 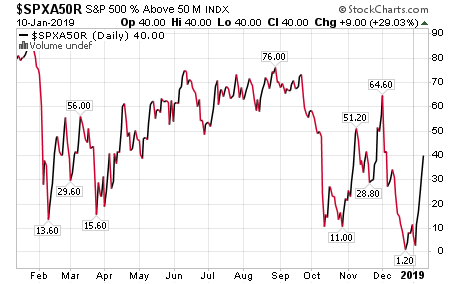 Consensus was a drop of 0.1% versus no change in November. Actual was a drop of 0.1%. Excluding food and energy, consensus was an increase of 0.2% versus a gain of 0.2% in November. Actual was an increase of 0.2%. The U.S. Dollar Index also drifted lower following release of the December CPI report. 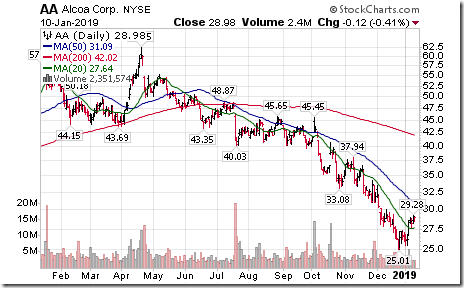 Alcoa (AA $28.98) is expected to open lower after JP Morgan lowered its target price to $57 from $79. 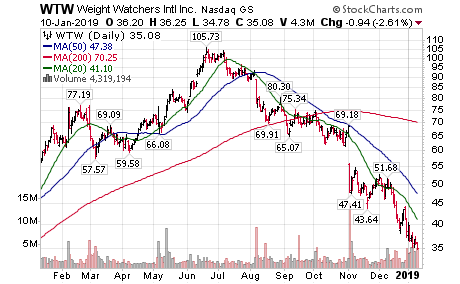 Weight Watchers (WTW $35.08) is expected to open lower after JP Morgan downgraded the stock to Neutral from Overweight. 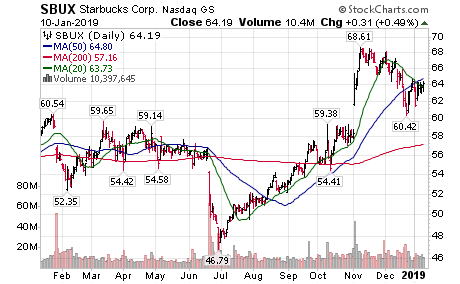 Starbucks dropped $1.72 to $62.47 after Goldman Sachs downgraded the stock to Neutral from Buy sighting a slowdown in sales in China. 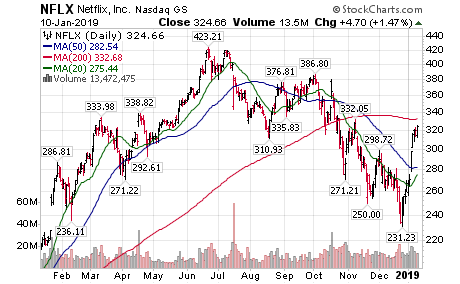 Netflix gained $8.58 to $333.35 after Raymond James upgraded the stock to Strong Buy from Outperform. Target was increased to $450 from $425. 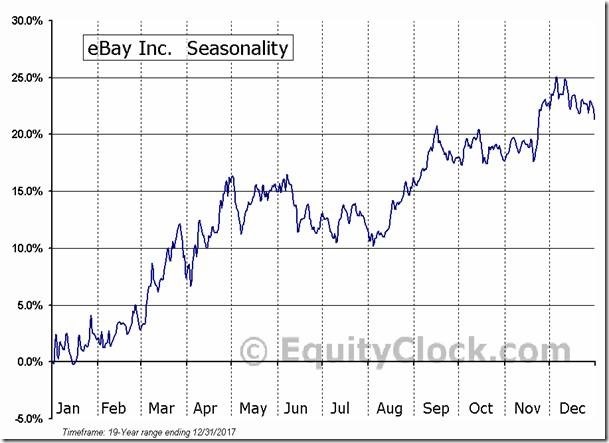 Note seasonality chart on the Biotech industry. Rogers Communications $RCI $RCI.B.CA , a TSX 60 stock moved above $54.46 U.S. to an all-time high extending an intermediate uptrend. 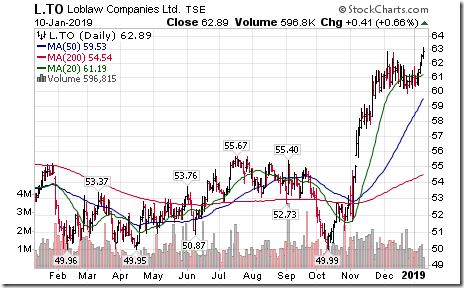 Loblaw Companies $L.CA, a TSX 60 stock moved above $62.89 to an all-time high extending an intermediate uptrend. 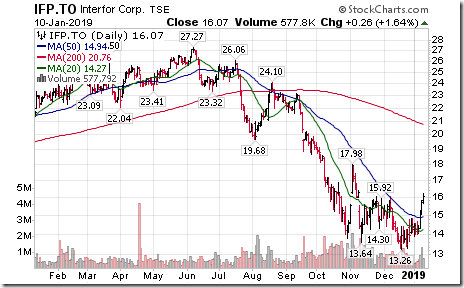 Interfor $IFP.CA moved above $16.07 completing a double bottom pattern. 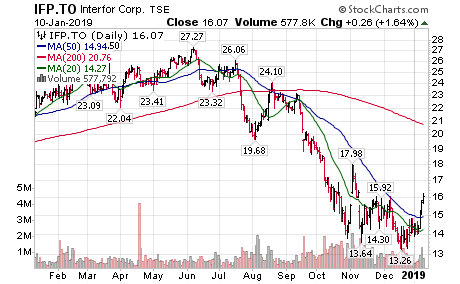 ‘Tis the season for Interfor $IFP.CA and other forest product stocks to move higher to the end of April. Fundamental prospects are improving. Inventory levels for copper and zinc are at or near multi-year lows. Largest user of base metals is China. A trade agreement between China and the U.S. will set the stage for a surge in demand for base metals. 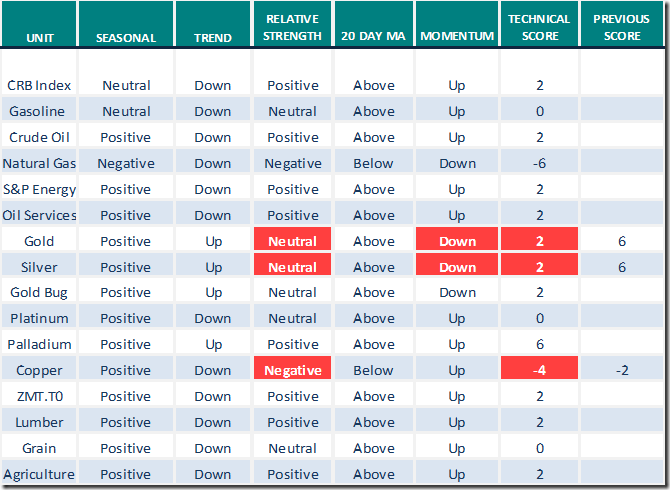 Seasonal influences for base metal prices and base metal equity prices turn positive in mid-January for a seasonal trade lasting to the end of April. 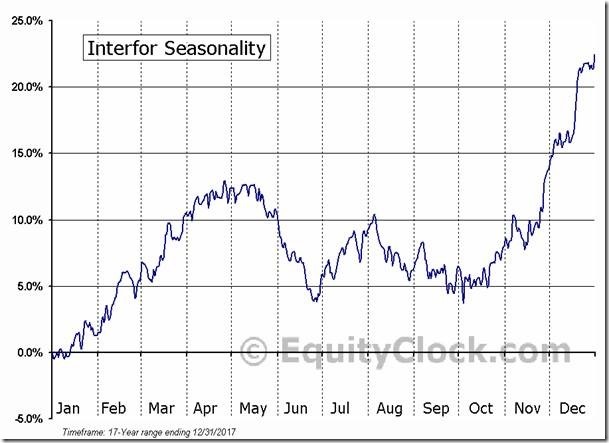 Technical picture for base metals and base metal equities is showing early signs of improving prior to start of its period of seasonal strength despite difficult North American equity indices since the beginning of October. 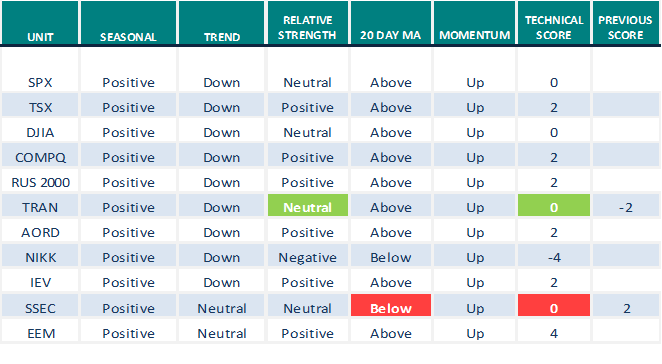 Prices have moved lower, but strength relative to the S&P 500 and TSX Composite has been positive since the beginning of December. Recent completion by the U.S. Dollar Index of a double top pattern is positive for commodity prices in general including base metal prices. The Barometer advanced another 5.35 to 60.91 yesterday. 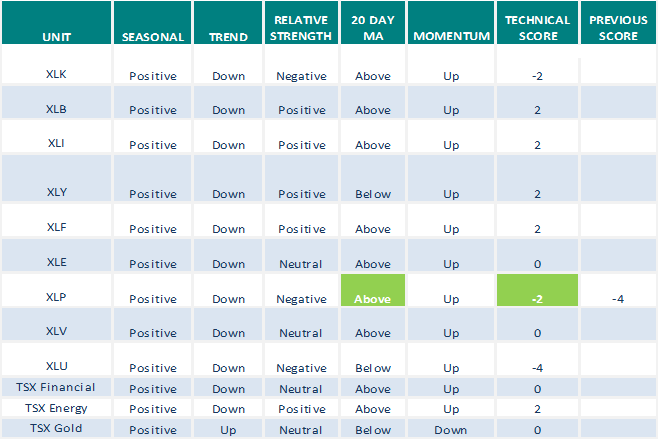 It continues to trend higher and has moved from Intermediate Oversold to Intermediate Overbought on a move above 60%. Good to hear you are alive and well. With all the bad news out of Mexico, I was thinking of you and hoping all was well. I was trying to remember if you are in a “gated community”. What bad news? You know how it is, most “news” that is broadcast is bad news and often fake news. In my community, we are mostly very, very happy and living among the Mexican people is great. I am in a private casa with a big secure wall around it -as is the style here. I have total privacy. I have no fear living hear. I still scan through Ciovacco weekly video and usually peek at his twitters too. #1. Tawny, Happy New Year! So good to hear from you! Have you remained in Mexico this entire time? Have you received your status that you were applying for from Mexico City? Yes I have been in Mexico over 4 years now. My standard of living is much greater than I could possibly afford in Canada. I live in a beautiful rented house which includes a maid two times a week, and gardener 3 times a week. Eat out frequently and attend local cultural events at prices perhaps one third of the cost in Canada. And of course a much better climate… not living at the beach, I am in the mountains… it gets cool in Winter here… as low as 8 at night, warming now though.. No percip. at this time of year. … highs up around 20 – 25 at the moment and usually lots of sun, warming the day. Winter is comparatively gentle, and it is short. Wishing you all a new year filled with contentment (for that is what is truly important). I have had my “temporal Mexican Visa” and will be applying for permanent in March (quite automatic I understand). This does not make me a Mexcian citizen. I am and always will be a Canadian citizen living abroad. Thanks for posting Armstrong…. so much appreciated. Are you a Socrates subscriber? 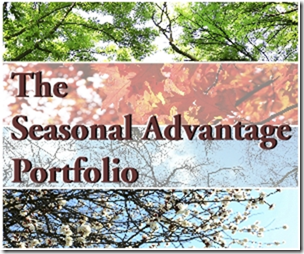 Would so much appreciate your posting the private blog info here in future too…. is possible? Wondering if you feel EXE.TO will hit strong resistance at this point and back off from its little run up. 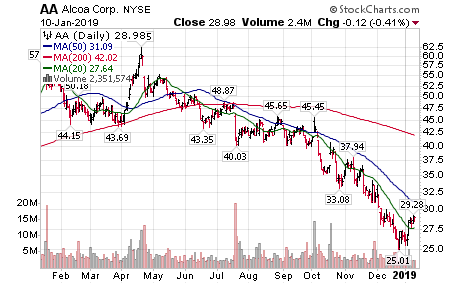 Its broken above the April/18 downtrend line today. 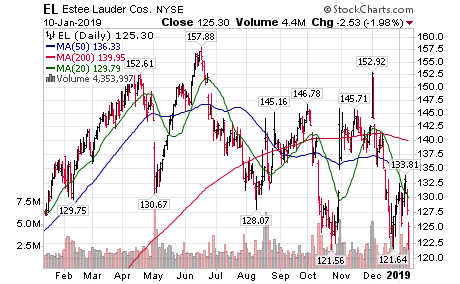 Still in this formation, backchecking the bottom shoulder line of the large head and shoulders that broke. Just not sure where the exact bottom shoulder line is. Thank you for your comment. I posted the very short chart to point out the gap. The resistance line is very clear in the area that you underlined, but that line goes over to the area where the large head and shoulders started that took us down to 2351. 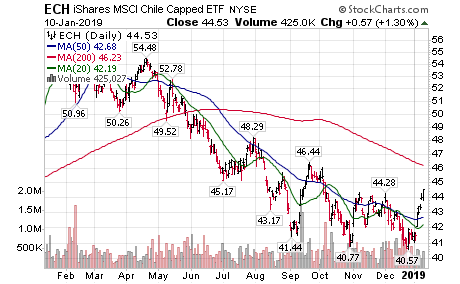 That line is slanted a bit and I thought that perhaps the gap would be filled prior to starting the next downturn that should take down again. EXE.to broke its multi year uptrendline and is now trying to bounce back to that broken line at 7.25. 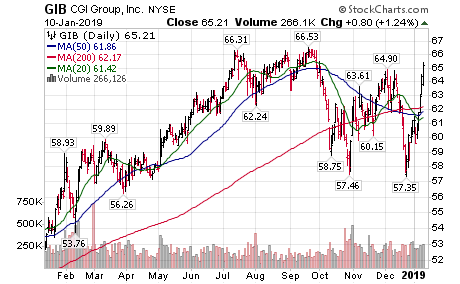 It did much the same thing when it broke down below 8.25 support and bounced back to the breakdown point and sold off again. 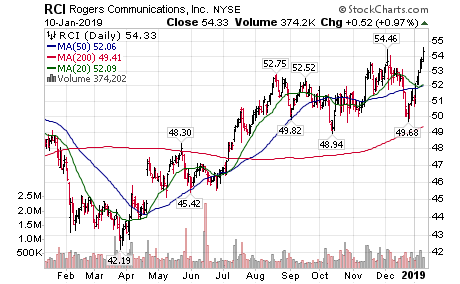 This is a very long term chart so descent bounces can be seen and traded but price would need to clear at least $7.00 to suggest strength ahead. 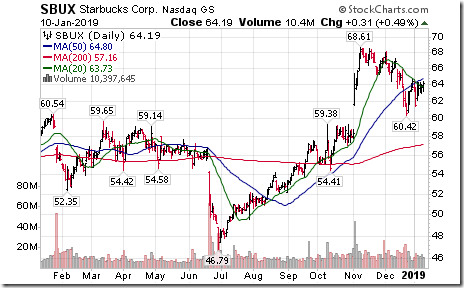 I don’t see much upside to this stock myself unless there is some shocking good news etc. Good to hear you are happy and doing well in Mexico. Sounds like you make a brave and successful life style change. All the best ahead…………………. Glad to hear that you have your temporary Mexican Visa. It sounds like a lovely life. The weather is the nicest part. I do miss the sun in the winter and have to work hard not to fall into a depressive state. Oh, by the way, you can now vote! Tawny: I too am glad to hear things are going well for you. I envy the weather you are experiencing right now. 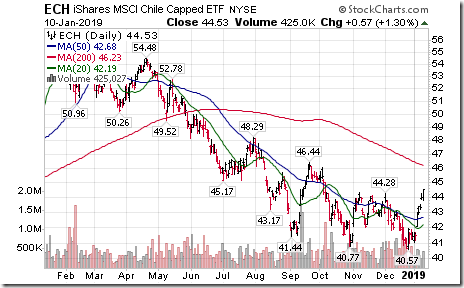 The small cap ETF:XSU.to (which tracks the Russell 2000 small cap ETF:IWM)is approaching important price resistance. That would be the 2018 support breakdown point as well as the downtrendline from September at roughly 30.75-31 area using intraday and closing prices. 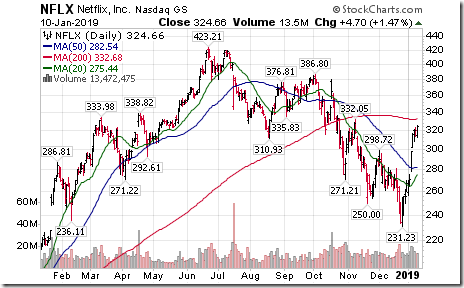 Need to see price clear 31 and hold above to be out of the woods. 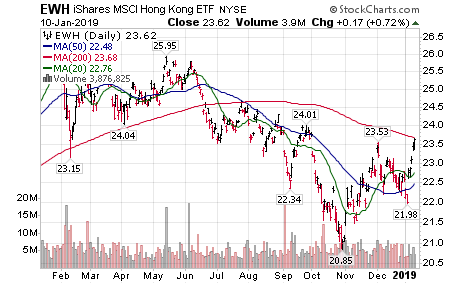 Not much volume on this ETF like most $TSX ETFs. 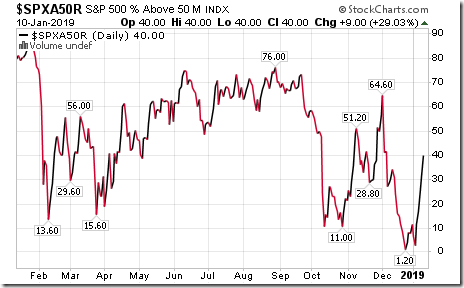 The #SPX ETF:SPY and the $TSX equivalant ETF:XSP.to track much the same. Here is that chart with resistance at 29.50 and the downtrendline from early Oct at 30.50. 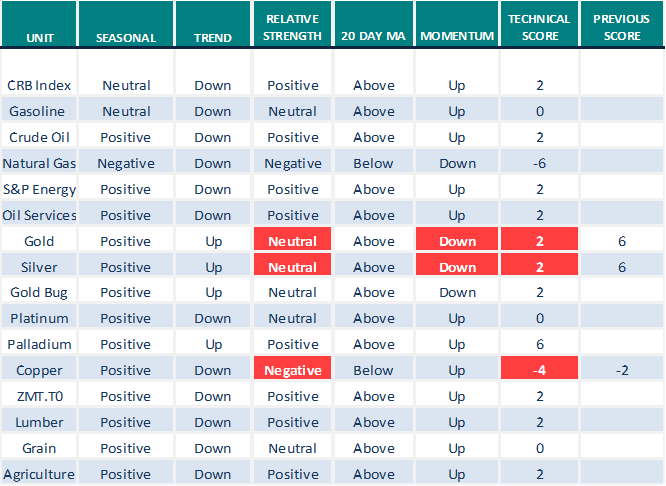 It will take a lot of momentum to clear these resistance levels. 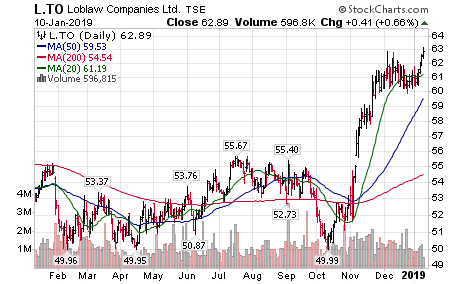 At least this $TSX ETF has plenty of volume to enter and exit. Like Sherri, I was subscribed to Socrates then let it lapse. Still seem to have limited access though. Your life in Mexico sounds very interesting. How do you cope being away from family? Has anyone had a peek at S.To lately? This is a great reason not to buy and hold. Oops, something went wrong with that link. Thank you re comments re #8. I am among thousands of expats, mostly Americans and Canadians.. so I feel at home. We are in high season now with all the snow birds – traffic is terrible at this time of year! Wishing you a new year filled with contentment, Ron. #13. Thank you for posting… I do like to read Armstrong and what the computer is forecasting so I very much appreciate getting these “extras.” At this time of life, I have very, very little family to miss. But there are many expats who live here full time and see family much less, but in our modern age of cell phones and Skype, etc. they are just fine with it. Every one is different. So I used Stockcharts.com and made a chart of S.to and tried to upload and post this chart as I usually do, but since clicking on your link I get the same comment and can’t upload charts anymore to post as it just goes to that same page. Any ideas? I just copied the link at the top of the Stockchart’s chart of S.to rather than upload it and copy which is what I usually do and it seems to work the same. I sent it to my own email and it opened. Perhaps Stockcharts has changed the way one copies and pastes charts. 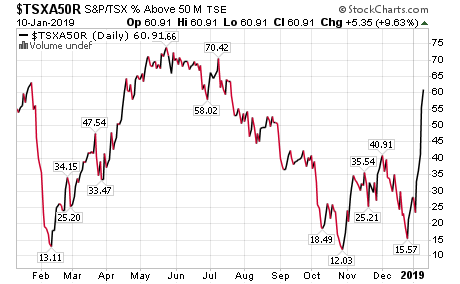 But as anyone can see this is just one of many $TSX stocks that over time has crashed and burned. 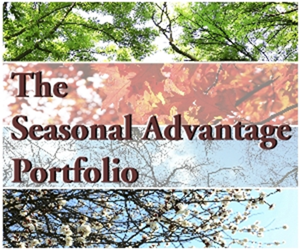 I recall someone mentioning on this site last year that very few stock investors were posting anymore. 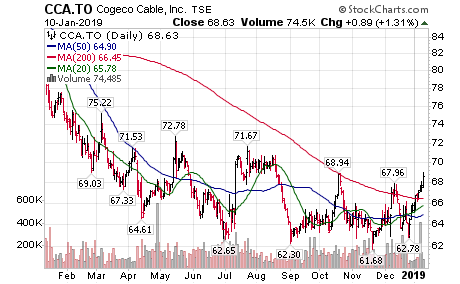 I recall at the time thinking that if anyone went through all the $TSX charts they’d understand why so many just aren’t interested in stocks anymore with the dramatic losses on so many stocks. 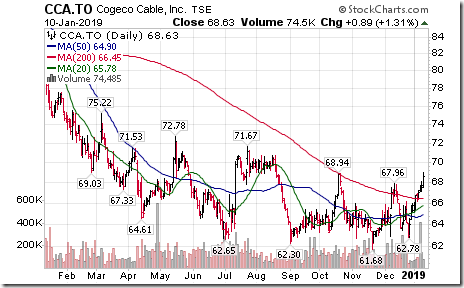 Most Canadians load up on Oil stocks and Mining stocks and Gold and Silver stocks and looking at them all there have been huge long term losses on so many of these and other types as well. Throw in the Royalty stock fiasco etc and there hasn’t been much to cheer about. Lets see if this link posts……….. I know! What a mess I made of my posts! Thank you for posting that chart of S.To. I think that they have changed their procedure too. Good idea to post on your email first, to see what is really posting. That is what happens when I think I know what I am doing! I was not able to sleep the other night and so I was spending time on my computer, trying to look up some of the old stocks that I once traded. 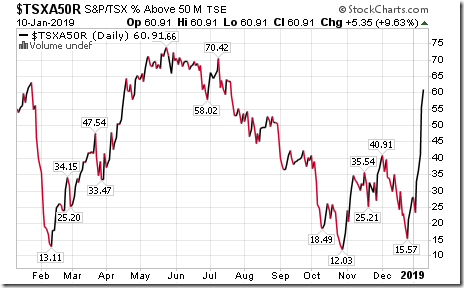 So astonished to see that the low in December for Sherritt was 37 cents! 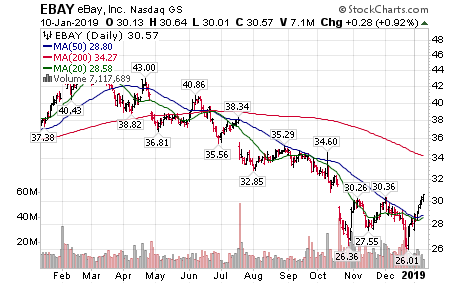 So much for buy and hold. Re #20: Maybe they need to call it “Buy and Fold”? Here is a Stockcharts 60 minute chart of the $SPX that I didn’t have to upload etc as I usually do and just copied and pasted the link. It shows up on my email back to myself but may not show here on this site. Normally no one can post intraday charts to anyone who isn’t a subscriber. Would be handy if everyone could post intraday charts for short term traders. That’s what I used to do mainly and used Qcharts which was about $200 per month for futures etc but was live. I do miss it but don’t trade enough to justify it. As far as “buying and holding” stocks it reminds me of the guy that walked into a blacksmith’s shop and picked up a horseshoe that was sitting there. He didn’t know it had just been heated and serviced so tossed it immediately. The blacksmith said, “Hot hey?”. The guy said “No,it just doesn’t take me long to look at a horseshoe.” That’s how I feel when holding a stock that starts to go south. Let me know if this shows up ok. 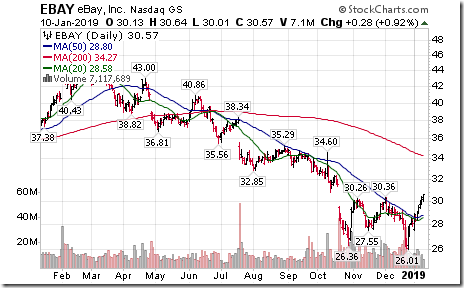 Despite its poor performance the stock is starting to look interesting. 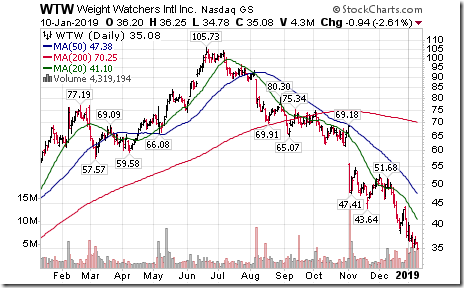 The 34-period EMA has flattened out. 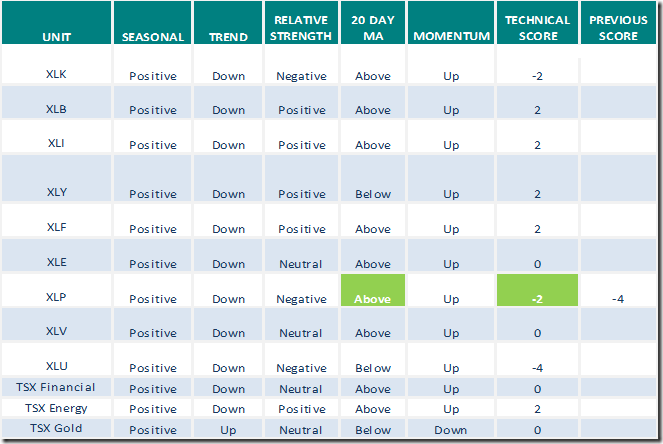 There is positive divergence of the conventional MACD – which recently made a bullish cross. Ditto for the short-term modified MACD. The long-term modified MACD has also just made a bullish cross. 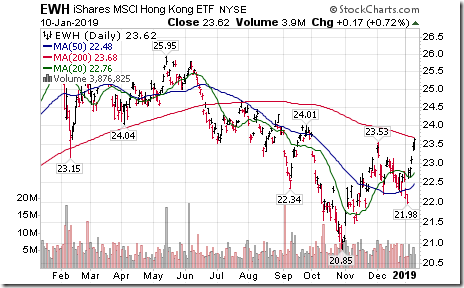 The RSI(21) close to turning bullish – as are other indicators. It is worth watching. 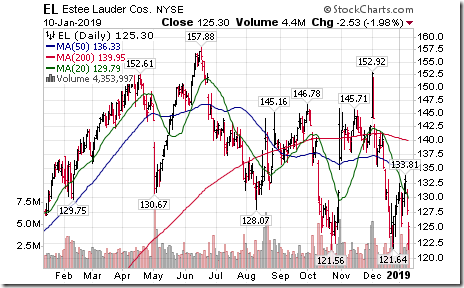 I am surmising that a Head & Shoulders bottom may be forming. An entry point may be near at hand – maybe. Deja vu, all over again…. (Dec 2011, June 2012, Aug 2016) and now Dec 2018. Is anyone able to post the stockcharts 7 year chart? or even a 3 year chart? you must have freestockcharts set up in internet explorer to see it. Something is “wrong” with this picture. Here is a multi year chart of LBS.to. You can change the time period as well. 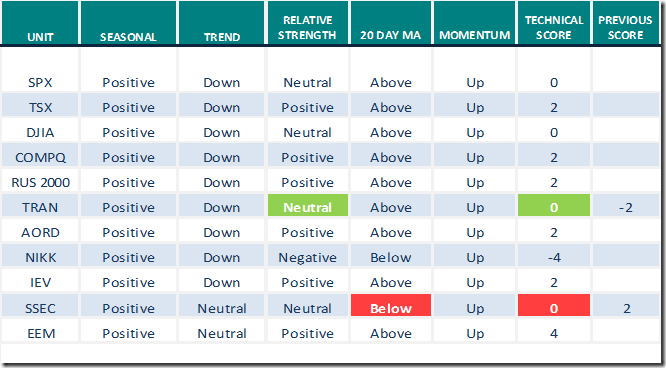 I find barcharts.com provide all the charts and technicals i need…….